Sandwiches, the ultimate portable food, can be enjoyed anywhere. But a quiet room in a quaint bungalow in Salt Lake City’s 9th & 9th neighborhood is the place to enjoy the self- proclaimed “best pastrami and corned beef in the country.” That might sound like hyperbole, but 9th South Delicatessen backs it up. You can get the corned beef in A Reuben Is a Reuben Already and the A Reuben in Jersey City sandwiches. Go for the pastrami in W. Weinstein’s Wow Pastrami or Mt. Nebo’s Pastrami. These are not movie titles, but the massive size of the sandwiches might keep you there for the length of a movie. And the time spent with a great sandwich, side salad and sour pickle in a relaxing location could just be the best part of your day. Would you pay $15.95 for a 12-ounce sandwich? Owner Randy Harmsen says that quality drives price. He wants you to feel the wow. If you do feel it, you’ll tell all your friends. Craving great corned beef, I ordered A Reuben in Jersey City, which has corned beef, Swiss cheese, Russian dressing and coleslaw on rye bread. The thick-cut meat is stacked high. It was tender, as corned beef should be, and also had a great pepper flavor. The rye bread also had a powerful flavor. How can these two strong components compete with each other? They don’t need to. They complement each other well, and were so flavorful that I hardly noticed the Swiss cheese or other ingredients. And 9th South Delicatessen now also serves breakfast. 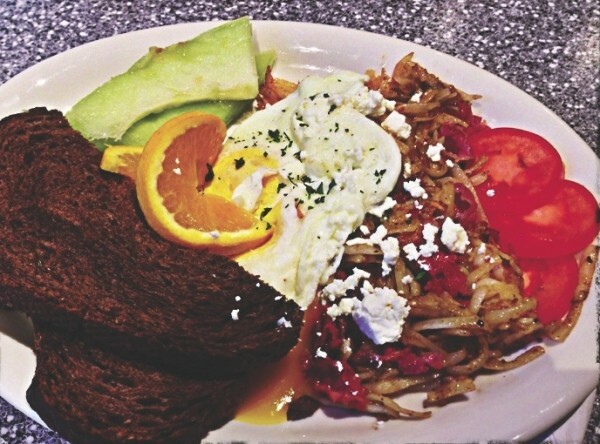 I returned to try the corned-beef hash with two cage-free eggs (any style), tomatoes, feta cheese, sour cream and pumpernickel toast. The hash is latke (potato cakes) instead of hash browns. When mixed with the spiced corned beef and feta cheese, it’s a savory delight.